As we entered the Thornton Gap Entrance Station on our first day at Shenandoah National Park we were told there was a high wind advisory and to be on the look out for falling trees on our hikes. When we had gotten up that morning we notice the high winds at our campground and I had already started making alternate hiking plans. 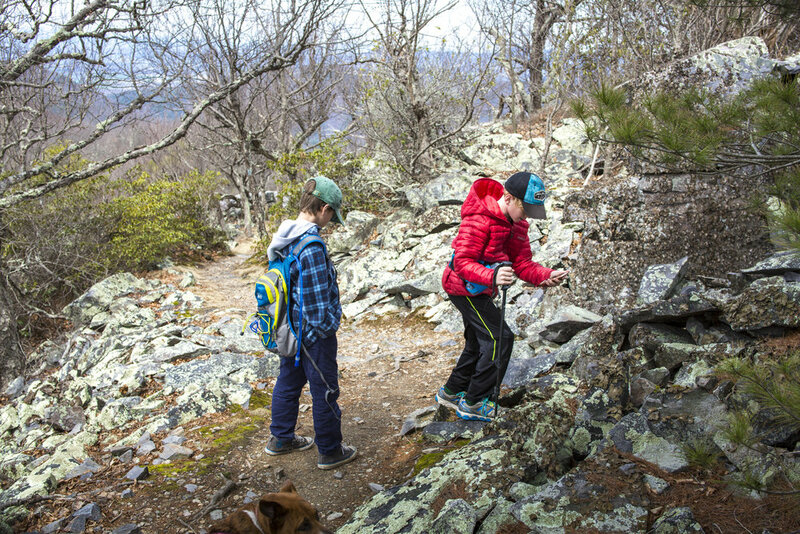 I had planned on doing a hike that would take us to the highest peak in Shenandoah, but with the wind I was a afraid we would get blown off the mountain. Now with the threat of trees falling on us we went with Plan B. So instead of a long hike we drove Skyline Drive and enjoyed the scenic views and overlooks. We entered the park at mile post 30 and drove south to the Byrd Visitor Center by Big Meadow at mile marker 51. At the visitor center we watched a nice video about Shenandoah National Park and I bought a Shenandoah collector's patch to add to my camera bag. We talked to one of the park rangers and got some additional maps for the park's hiking trails. I came with a Falcon Guide "Best Easy Day Hikes Shenandoah National Park" and I had already planned most of our hikes using that guide and AllTrails, but I always enjoy talking to the rangers to get any additional tips for hiking trails. We got back in our truck and continued driving south to mile marker 84.8. There we parked at the Blackrock Parking Lot. We decided to hike to Blackrock Summit since it was only a 1 mile loop and it looked like it would have good views despite the wind. This trail was short and sweet and the views were fantastic!!! We always enjoy a good rock scramble and climbing up the rocks to get a panoramic view was so much fun. When the winds kicked up we had to brace ourselves so we didn't get knocked over! I would highly recommend this hike to anyone. It was easy to get to Blackrock Summit and if you wanted to make this a longer hike there is a trail that connects to it, The Furnace Mountain Trail. Also there is the Blackrock Spur trail (you can see it in the map in the picture above). It was also really nice to enter from Thornton Gap and get to see a lot of Skyline Drive heading to this hike especially since it was our first time visiting this National Park. The mountain views really change along the drive and I'm glad we got to see so much of it. After the hike we headed back north on Skyline Drive and to the campground. I made notes on my map of where we should stop for lunch on the next day. We also stopped at quite a few overlooks and ate our lunch at The Point Overlook, which is at 3235 foot elevation. I was hoping to see some bears, but we didn't. We did talked to a Thru Hiker on the Blackrock Summit Trail and he said there was a bear two miles back from that trail that ran across the road. We kept our eyes peeled but we didn't see it ourselves.